I’m one of two Belfast comics creators who have recently rolled out a comicbook about epilepsy. It also features time travel devices, body-jacking and telekinetic battles, as the author drinks and writes his way through three decades coping with the condition. What starts out as a rumour becomes a very real trouble, and possibly a great opportunity. “Absence” is the product of a pool of talent, including artist Stephen Downey. An award for social entrepreneurship from the UnLtd Millenium Fund allowed for Stephen to take the commission, and for me to ready distribution of 10,000 free print copies over Northern Ireland. Norwegian company Oxicomics have donated their aid, and translated the book for hand-held devices. Having made around twenty comics over fifteen years which I’m more used to these being seen by 100 people, on one level, it’s the usual business. On another level it feels like my first comic. Stephen Downey, on the other hand, is barely five years into his career. 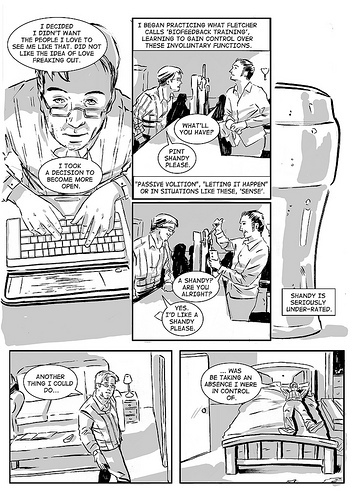 Already he has delivered the critically acclaimed graphic novel Cancertown, and a strip for the BBC’s Torchwood comic. In a few weeks, Stephen and his Cancertown collaborators will release the graphic novel, Slaughterman’s Creed, under Markosia. The graphic novel is described as ““Get Carter” meets “Lone Wolf and Cub” in an abattoir.” Then within the month, the first issue of his mini-series Jennifer Wilde will also be published, under Ireland’s Atomic Diner Comics. A historical mystery set in the 1920s, it stars Oscar Wilde’s secret daughter and the ghost of Oscar himself in an espionage plot that takes in France, England and Ireland. The original art is some of the most beautiful comics I’ve seen in a long while. Belfast, Northern Ireland has been the home of many renowned Western comics professionals. Will Simpson, Davy Francis, Garth Ennis, John McCrea, Malachy Coney and PJ Holden. In recent years, these have included Paddy Brown’s The Ulster Cycle and from Beserker Comics, The Dead, co-created with Alan Grant, Glenn Fabry and Simon Bisley. With Absence, we set out to avoid a dry, preachy screed and create instead a comic, with all the possibilities for engagement, and excitement which that includes. One of the UK’s top epilepsy specialists obviously thinks so, calling the book “quite enjoyable”. The 2,000 readers in the last week include comics professionals, epilepsy sufferers, carers and teachers. Absence is, you see, a concise edition of my life with epilepsy – the dumbass things I’ve done, the years of triumph. Don’t mistake it for a medical tract. This is for people who think a seizure is dealt with by putting something in someone’s mouth. For people who get freaked out when they witness a seizure. For people who enjoyed comics from an early age. Y’know, everyone. Absence is live as a free webcomic at http://www.absencecomic.com were you can download a print-ready pdf or just read it fron your desktop. It’s also available as an app for iPhone, iPod touch and iPad on the Apple store courtesy of a donation by Oxicomics. I’ll be signing copies of Absence at the Red Barn Photographic Gallery on Rosemary Street in Belfast on Saturday 21st May, from 11am.